Caracas: In 24 hours, a 35-year-old Venezuelan opposition leader declared himself the country’s president, the US recognised him as the legitimate head of state, and president Nicolas Maduro ordered American diplomats out of the country. Venezuela’s opposition leader Juan Guaido declared himself interim president on Wednesday, winning backing from Washington and parts of Latin America and prompting socialist Nicolas Maduro, the country’s leader since 2013, to break relations with the United States. What did the US do that angered Maduro? US President Donald Trump formally recognized Guaido shortly after his announcement and praised his plan to hold elections. That was followed by similar statements from Canada and a slew of right-leaning Latin American governments, including Venezuela’s neighbours Brazil and Colombia. Which other countries have taken a position on the crisis? Lawmakers in Russia, which has invested heavily in Venezuela’s oil industry, provided support to its military, and became a lender of last resort as the economy imploded, denounced the declarations. Lower parliamentary house speaker Vyacheslav Volodin called the steps to remove Maduro illegal. In Ankara, Turkish Foreign Minister Mevlut Cavusoglu said recognising a leader other than Maduro might cause “chaos”. In Paris, a presidency official said France was consulting with its European partners about the situation.China said it opposed external interference in Venezuelan politics, while Spain said fresh elections were the “only way out” for Venezuela. What has Guaido promised to people? At a rally on Wednesday in the east of the capital Caracas that drew hundreds of thousands of Venezuelans, Guaido accused Maduro of usurping power. He promised to create a transitional government that would help the oil-rich nation escape its hyperinflationary economic collapse. “I swear to assume all the powers of the presidency to secure an end to the usurpation,” 35-year old Guaido, the head of the opposition-run congress, told an exuberant crowd. Guaido’s declaration takes Venezuela into uncharted territory, with the possibility of the opposition now running a parallel government recognized abroad as legitimate but without control over state functions. In a televised broadcast from the presidential palace, Maduro accused the opposition of seeking to stage a coup with Washington’s support. “We’ve had enough interventionism, here we have dignity, damn it! Here is a people willing to defend this land,” said Maduro, flanked by Socialist Party leaders. Who does the army support? Any change of government will rest on a shift in allegiance within the armed forces. So far, they have stood by Maduro through two waves of street protests and a steady dismantling of democratic institutions. U.S. Secretary of State Mike Pompeo called on the Venezuelan military to protect “the welfare and well-being of all Venezuelan citizens,” and said Washington would take “appropriate actions” against anyone who endangered the safety of US personnel. Defence Minister Vladimir Padrino said on Wednesday that the armed forces did not recognize a self-proclaimed president “imposed by shadowy interests ... outside the law.” Military top brass indicated their continued support for Maduro in tweets. Is this a sudden development? No – the crisis has been years in the making. Venezuela once had Latin America’s richest economy, buoyed by oil reserves even larger than Saudi Arabia’s and Iran’s. Yet under Maduro and his predecessor and mentor, Hugo Chavez, who died in 2013, Venezuela’s economy spiraled into mismanagement, corruption and backbreaking debt. Hunger is killing Venezuelan children at an alarming rate, doctors say, as stores have run out of food and children are suffering severe malnutrition. The country’s hospitals are “like something from the 19th century,” one doctor has said, collapsing under chronic shortages of antibiotics, food and other supplies. Have those conditions led to violent protests? Yes. 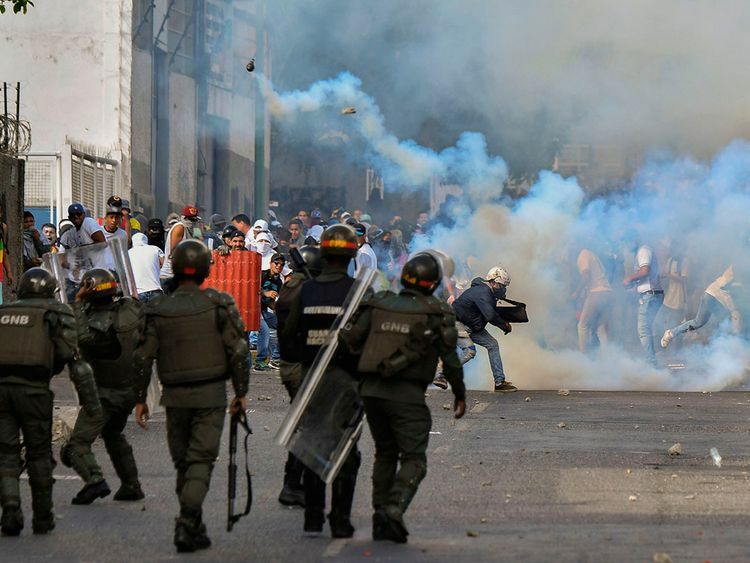 The desperate conditions have led to mass, sometimes violent demonstrations, and skyrocketing crime that has forced Venezuelans to create ever-evolving countermeasures, like decoy cellphones and armored cars. And inflation has ballooned to 1 million percent, making money all but worthless. In a potent symbol of Venezuelan anger, demonstrators in the southern city of Puerto Ordaz on Tuesday toppled a statue of late socialist leader Hugo Chavez. They broke the statue in half and dangled part of it from a bridge. In the Chacao district of eastern Caracas, a traditional opposition bastion, a dozen protesters spoke of a renewed confidence in dislodging Maduro and predicted a new wave of demonstrations. “The struggle will be long,” said Ciro Cirino on Altamira plaza, minutes after police on motorbikes charged a crowd of several thousand protesters, firing tear gas to disperse them. “We’re hungry. Look how skinny I am: there’s no food in my house,” said another protester holding a petrol bomb, who declined to give his name “We have to get rid of Maduro.” Some 3 million Venezuelans have fled abroad over the past five years to escape widespread shortages of food and medicine. How did the economic collapse begin? The economic collapse began in the ways Chavez wrested power, paid for loyalty with oil and purged his enemies, our Interpreter columnists wrote in 2017. After he inherited a collapsing economy, Maduro granted the military control of lucrative industries and printed money to dole out patronage - worsening the crisis, but retaining power. Maduro has also held on by stifling dissent: Human rights groups say he has arrested more than 12,800 people. In 2018, he won a widely criticized re-election, with reports of coercion, fraud and electoral rigging. Maduro has also cracked down on the press - including The New York Times, kicking a correspondent out of the country in 2016. So was there no opposition? Divided and stifled, the opposition had struggled to pose a challenge to Maduro until the National Assembly leader, Guaido, managed to rally its factions in recent months. Guaido, a 35-year-old industrial engineer who was little known at home or abroad until this month, declared himself president on Wednesday. Why are Venezuela’s neighbours worried? The humanitarian and economic crisis in Venezuela has not stayed there, alarming its neighbours in Latin America. Thousands of refugees have fled by land and sea to Brazil, Ecuador and other nations, increasing tensions. Thirteen nations in North and South America denounced Maduro this month, urging him to hand over power to Venezuela’s National Assembly to stabilise the country. The US, long at odds with Maduro, has become increasingly vocal under Trump, whose administration has imposed a series of sanctions and held secret meetings with rebellious military officers from Venezuela. Maduro has accused the US of plotting a coup, and he claimed that unknown enemies used a drone to attack him during a military ceremony last year.